There are a lot of ways to model a pumpkin. I probably have too many steps. Basically, you want a sphere with vertical ribs, a sunken top from which a stem emerges, and a flattened bottom.I chose to us the vertex modeler. In the vertex modeler, I inserted a sphere and reduced the number of sections and sides (because I will be increasing the number of vertical later). I chose 6 and 12. Using the scale menu, I entered larger numbers in the X and Y axis than the Z axis to fatten the pumpkin. I selected a vertical edge and hit loop. I then hit ring to get all the vertical lines. I de-selected the top or bottom vertexes. I then used the Extract Around tool and made sure that no lines crossed near the poles. The pumpkin now has a number of wide vertical panels. Because I used the extract around in an early step, the top and bottom of the model have some n-gons (5 sides in ths case). I connected vertexes to restore the top rings.. I then selected the polygons of all of the wide vertical panel strips, but not the top or bottom, nor the narrow vertical strips. I then used the scale tool to expand the wide panels relative to the narrow vertical strips (to taste, but does not have to be a lot). I the checked smoothing and you cansee that the pumpkin now is a flattened sphere, but with some vertical seams. The top of a pumpkin is sunken. I unchecked the smoothing box. I selected the top circle and move down in the Z axis. I turned smoothing back on, returned to the Assemble room, and confirmed the general pumpkin shape. I have decided to make the pumpkin and stem a single mesh. You could have the stem be a separate mesh, but I did not want to do that. I want enough geometry near the base of the stem to preserve the sharp angle because I will be using smoothing, . The way I do that is to use the extrude tool in very small steps. I selected the top polygons of the pumpkin. Using the extrude tool with the LINK box checked, I held the shift key down and dragged to establish where the stem would begin. I then repeated twice in very small increments so that the base of the stem was protected from sideways smooting. I then extruded twice more, but this time holding the control key instead of the shift key. This starts the stem upwards and again protects it from being distorted by general smoothing. I extruded a couple more times and curved to taste for the stem. Again, at the top, have a couple small extrudes to protect the shape. Here is the result with smoothing. Ultimately, the plan is to use this model in the plant modeler. When using an object as a "leaf" in the plant modeler, I ind it more conventient to apply just 1 global shader to the "leaf" even if the leaf has multiple shading domains. To do this, it is convenient to UV map the object so the shading domains are easily identified. I then use a single layers list shader for the "leaf" object, in this case a pumpkin. For this project, I just need to have a texture map that separates the stem and the pumpkin. Create separate shading domains for the pumpkin and its stem. You could use projection mapping and apply a sphere preset to the pumpkin shading domain and a cylinder preset to the stem shading domain. 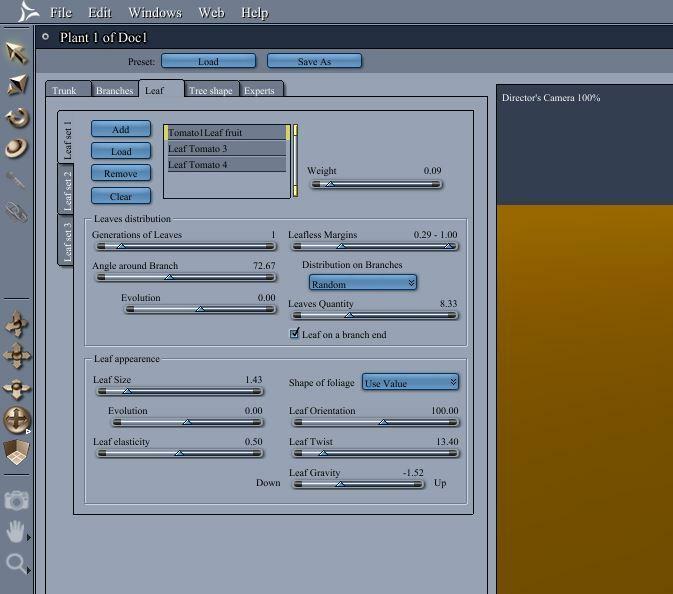 However, TangoAlpha has identified a quirk with one of the columns whenusing these presets so I used seams and unwrap. However you do it, uvmap the pumpkin to separate the main part of the pumpkin from the sphere. Hwever, you get your uvmap, go to the display tab in the uv editor and export the map. Here is the result of applying some presets, not seams/unwrapping. As I said, ultimately I did not use that uvmap. I took my uvmap into my image editor and created a black/white opacity mask that I could use in a layers list shader to separate the stem from the pumpkin. I selected the pumpkin vertex object and entered the texture room. I changed he top shader to a COMPLEX SHADER : LAYER LIST. The top shader in your list starts by covering the whole object. Subsequent layers will be applied wherever your opacity mask says should be white. I applied a green color gradient procedural shader to the stem and an orange color gradient procedural shader to the pumpkin. I converted the smoothing to full mesh. Not necessary, but that is what I did. FORGOT - Leaves for the plant modeler are oriented on the floor and top/bottom along the x axis. See prior discussion in this thread on making a maple tree. So, I started the vertex modeler again, selected all of the vertexes, and rotated so that te mesh was oriented correctly. Ready to load pumpkins as leaves on a plant. I saved my pumpkin to my browser (and saved my global pumpkin shader as well). I inserted a new plant object. I went to the leaf tab, removed the default leaf, and LOADED my saved pumpkin. The default is pretty funny as I got a giant pile of intersecting pumpkins. I lowered the quantit settings for the leaves. I also eliminated symmetris to reduce the number of pumpkins. With the pumpkins now being the leaves, I entered the trunk and branch menus. I used the angle, curve, and intermodal length settings try to make it more vine-like. See disussion of maple tree for these settings. As PhilW has pointed out above, you might be better off keeing the pant vertical and then rotate it as an object 90 degrees to lay on the ground. ... and pasted to the trunk and branch shaders of the plant. Now the plant vine matches the pumpkin stems. I inserted a terrain and rotated the vine to hide the branches I did not like. The result is the yucky pumpkin patch with Jack Pumpkin. However, while I would do it differently for vines along an undulating terrain like these pumpkins, this basic method can be used for vine-like plants. So, I was trying to think of other stuff that grows on vines. 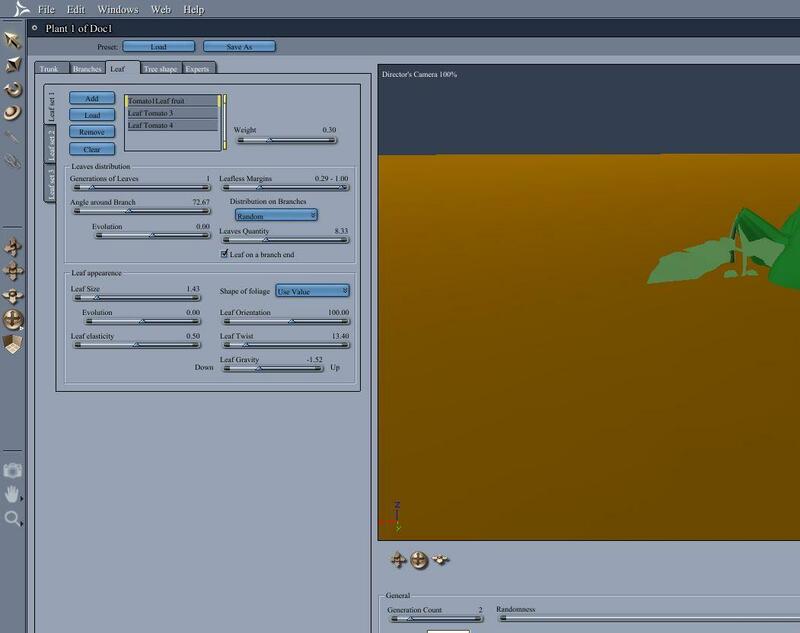 So, I inserted a new plant model and loaded my saved pumpkin as a leaf. I made some adjustments to the trunk to get a curvy vine. For a sparse vine, can lower the number of branch generations, which I set to 1 just so it is easier to see here. Similar adjustments to the branches. Enter the shader room and change the pumpkin to a tomato. In practice, would want some green leaves in addition to the tomatoes. First of all... Diomede... such a wonderful article! I love how you make these things! so enjoyable and, no matter how much experience one has, we can always pick up on some sort of new idea or technique... so cool... Thanks! One thing I noticed in the earlier shots of the Red Maple leaves in the editor is that Maples don't grow their leaves in that pattern. I only say that because you're trying to replicate one, and the manner in which they were arranged made for more leaves than are necessary for that tree. It's hard though, and though I may know that it's not right, I also don't know exactly how they are arranged either - I'm no expert on trees. I do know that, when we say "Red Maple", many people (wrongfully) thuink that we're talking about Austrian or Norway Maples which have the reddish or purple leaves in the summer. Acer rubrum has green leaves with red veins underneath, and have a brilliant red color in the autumn! Very hard wood, very high-quality tree! Yeah, I did this with my EnvironKit trees, since I had originally meant them all (except the "Specimen Maple") to be background trees. Along with other scene/render savings like being careful with generation counts and such. That's why my (EnvironKit) evergreens can look a little strange close-up - the needles are really quite large. In making the trees and everything else in those kits, especially the first one, Woodlands, I spent a LOT of time with many settings - including the much debated translucency topic. Maybe not debated... but what I meant was debated by "Me" as to whether or not I would use it. In the end I added (what people call "Bounce") Ambient (ground reflection) lights and tweaked them to help remove the ickiness that we can get with a lot of leaves without using translucency. The translucency on leaves can be a big reason for renders to take a l o n g time. Same with using a simple polygon and a trasparency map. We're asking a lot of the render engine in either of those cases. Well... we're always asking a lot from that engine! But translucency asks each ray to grab something as it passes through the material and apply it as illumination to the shadow it leaves behind. Tranparency maps are almost as taxing, but not quite - simply because it's making shadow calculations that much more intense. So, if we have both tranparency maps AND translucency, we can really create some (beautiful) renders that take a very l o n g time!!! Since my intentions were to make for a simple background-builder construction kit with my EnvironKits, I wanted to make it very user-friendly - and that meant that I wanted people to have the flexibility to add something and shoot a test render, and so on instead of giving them a fully realized finished scene. I Love Howie's scenes and have learned a lot from them over the years. But one thing I've also learned is that I cannot really bring in a figure and shoot a test render unless I turn of the scenery entirely. I don't mean to make this sound like a downfall of highly detailed and wonderful scenes like this... I really don't. I just want to point out that this is why we don't see these things set up as a default in EnvironKits. So instead of using translucency, I've opted for three enhancement lights coming from the ground. Instead of Trans Maps, I used geometry leaves. Instead of having a LOT of leaves, I use less leaves and make them larger - it's still a lot of leaves... just a LOT less of them! These all really help to reduce scene weight and render time. Still... I'm amazed at how quickly Carrara can render highly detailed trees at a distance! Granted... nowhere near the amount of trees - and that's another clue. So for EnvironKits, instead of replicating trees over a large surface, I made smaller surfaces and placed the trees by hand. Working in and around woods as much as I do, I see them a lot. So I know that there is a lot of density in a natural woods. Trees shade out other trees. Some such trees cannot live in the shade, so they die and eventually fall over. So I placed some living trees around, added some chlorotic ones that are showing signs of struggle (less leaf density/lighter colored leaves) some dead ones and some dead shrubbery along with some living shrubs. I made the terrain chunks really tall, with a smaller surface for placing my trees. This was all under the idea that I would then replicate thes chunks onto larger terrains with random Z rotation and height. The thing is, after making three sizes of these 'chunks' of planted terrains (the largest of which has replicated trees/deadwood instead of placed), I found that I didn't want to replicate them. It was too muc fun to duplicated them and arrange them by hand - and the result made for a much less RAM-heavy scene! Thank you, Dartanbeck, for these great insights. Your comments, Tim's, Phil's, etc. are the main reason I have kept this thread going. First, I found that I retain more info if I try to explain it myself. Also, it gathers info together in a place I can find it later, in the absence of better documentation. I have started a similar thread for Studio. That is why I have all of the screenshots and mini-tutorials Second, people can see what I am doing wrong ( or right) and then give me pointers and suggestions. Pointers is one thing, but I am truly amazed (in a good way) that you and others are willing to share so much about how you build your sets and other content for sale. The generosity of Carrara PAs is staggering! Back to the substance. Thanks, I will be experimenting more with the maple and acacia trees after I get my own reference pics. The national arboretum and the botanical gardens are right around the corner, although very different from nature. So, I might drive out to the Shenandoah Valley and Skyline Drive soon. Had planned to do it later this week, but I've been called for jury duty. When I have my own pics, I will be returning to those projects. Hope you will peek in and give me more insights when I get going again. 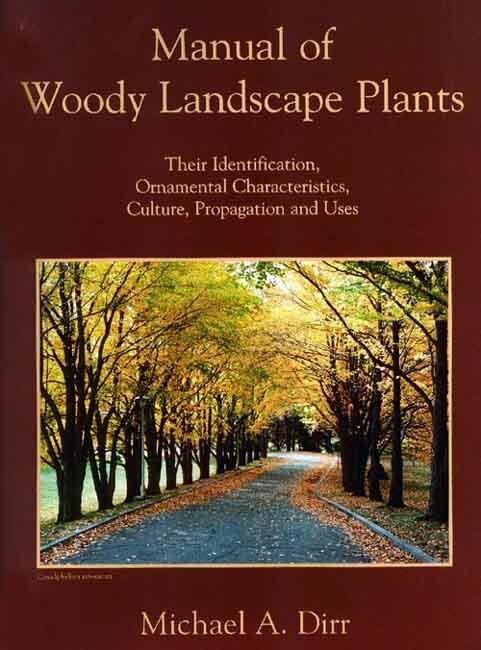 I didn't use this in Woodlands - I just made mine to personal taste, but if you're really into trees and shrubs, this is a book that is indespensible! I can't believe I'm seeing it at Barnes and Noble for $14.99 USD... I paid well over $100 for it when I was in college - even with a student discount! Manual of Woody Landscape Plants, by Michael Dirr, is the Bible of all! At 1187 pages, it's the only tome in my collection that so dwarfs my Carrara 7 Pro revision G user's manual printed out! I never use it - sadly. EDIT: As much as I always wanted to specialize in Trees, Shrubs and Perennials, once I agreed to chisel some stone it was all over for my having anything to do with plants - except that I was very good at placing and planting them - so I always got to do that in addition to my stonework duties. Looks like you already have a great source for obtaining what you need to know though. And actually going to the Arboretum and doing your own studies, sketches and photos is the best! Hope you will peek in and give me more insights when I get going again. Thank you, Dartanbeck, for these great insights. Any time, my friend! I love to share! After the great examples from you and Artini, how could there not be interest? What you are doing is too good to ignore. The problem for me is getting pulled into too many directions at once. I still want to become at least competent in the modeling room, and to learn animation. I haven't started either yet. So forgive me if it takes me a while to get going here (even though I actually purchased PSE 8 today, thanks for the recommendation). Now that the Challenge is over, there should be more time for learning. Best way to use them is subtly, but building one upon t'other to get a final result. From watching others it seems there is a want for a one click make art button ... so far I haven't found it. Thanks for the advice. There are some one-click filters (and some look very nice), but that is not what you are doing. Glad to hear. The before image is just the beauty pass. There is much more info in eg the diffuse, the shadow, the reflection and the colour pass ... also depth and index amongst others. Plus info in the photon pass. Ah, that makes it clearer. I'd like to see the full Carrara version as well, but if it is too much hassle, forget it. What percentage of your finished work (typically) is the Carrara-generated part? How much time (percentage) is spent in Carrara vs spent in postwork? I realize that your answers will probably vary from render to render - just wanting to hear your own subjective idea of some ball-park numbers. My experience is that the last 2% of the render - getting it just right - takes about 50% of the total time! - and concentrate on the render passes and the post work. the idea is that you look at your beautyu pass and ask why doesnt it look like a hand render? I'll post some images soon! Also, back when 3d imagery was fresh and new, seeing that plastic specular shininess was pretty cool to see - for a little while. Then (and especially - Now) people got pretty sick of seeing it too often. That's why and 'easy' fix for folks to be rid of too much specular highlight in Carrara has been to ommit the highlight channel - turning it to pure black or 0 (zero) or just None. Materials actually look better, in the end, with at least some range of highlight and a well set shininess value to create the appropriate interaction with the lighting in the scene - and also to make sure that the lighting is appropriate for the scene. But, yeah... to many colors and to accurate specular highlights along with a certain lack of imperfection to everything draws our eyes to signal our brain that this is not "Art", but something that has been "Manufactured" or spat out of a geometry machine. Somewhere, somebody (SteveK?) just posted a cool video about the ever-difficult search for NPR tools that was most interesting. Don't think that I mentioned this above. If you are using the plant editor to make a custom plant, and you are using multiple leaves, you can play with the share of each leaf in the total. Do this by adjusting the weight setting for each leaf. Here is a comparison. I have a custom plant with a curving trunk and short leaves. I loaded 3 custom leaves, of which two are shaped like traditional leaves and one is shaped like a tomato. Here is acomparison of setting the tomato weight at 09 and at 30.
very interesting stuff Diomede :) Love the pumpkin patch wip. I know it's not carrara plant modeller but do you have fenric's port of the ivy thing? you could use it for generating a vine along the ground then replicate pumpkins along it ? Thanks for the pointer to the ivy plugin, HW. No, that plugin had escaped me until now. Can think of lots of uses for it. Played a little more with my tomato plant. I saved it as a prop in DUF format for use in Studio. Out of curiosity, I loaded the saved DUF file in Carrara. 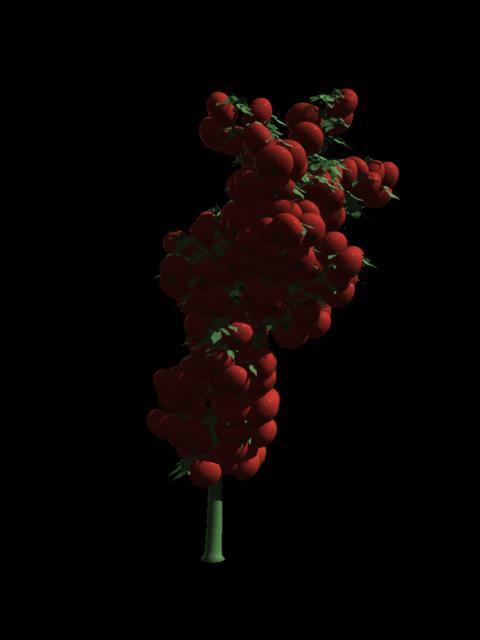 As currently constructed, this tomato plant has over 500,000 polygons. 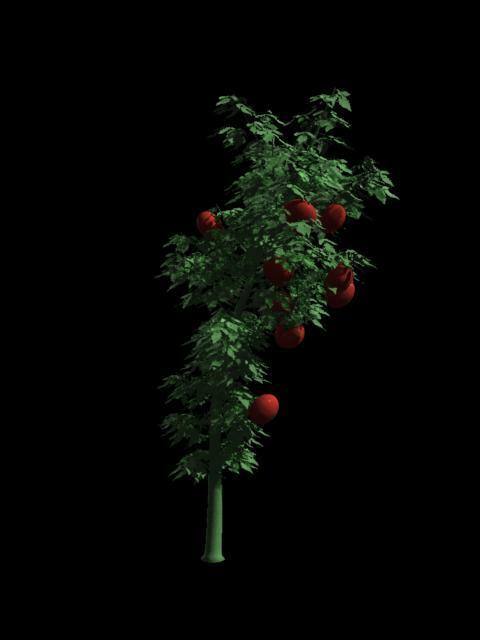 I only applied the simplest procedural shaders to the trunk, branches, leaves, and tomatoes. When exporting the plant as an obj from Carrara, make sure the "full detailed mesh" box is checked in the plant modeler preview window (and I select "tree" from the preview window drop down menu). When exporting as an obj from Carrara, choose the Daz Studio Full Scene preset scale. When importing the obj in Studio, choose the Carrara preset scale. When imported, the obj is loading in Studio without textures so I suspect I am missing something, even though I checked the box on export. I used the Studio surfaces pane to apply simple shaders for this example. To create the DUF file, in Studio I selected FILE : SAVE AS : SUPPORT ASSET : FIGURE/PROP ASSET and saved to a folder for custom props. In a new Carrara scene, I loaded the DUF version directly from my saved preset location. You should also untriangulate the model before you export - will help keep the poly count down. Unless I'm mistaken, it's natural for OBJ files to import without textures - or am I missing something too? I'm used to having to build new shaders in the target software. Exporting textures during OBJ export simply provides the textures in map form in the same folder as the OBJ file. I could be wrong. Since I build new shaders in the target software (using the same maps as I used in Carrara), I haven't been exporting textures with my obj - but if I wanted to convert procedural shaders to maps, then I certainly would include the maps with export. is possible to use carrara displacement to model cobblestones from a plane? Here are two thoughts. I bet there are better ways that I am not thinking of. hmmm, the link isn't going to the specific comment, need to scroll down the page. Don't know why. I clicked the time stamp of the specific comment. - displacement tab in the shader tree in the shader room. This is where you have to remember to check boxes for the 3d view. ty , was the subdivision to remember to tick? !